A nice 38 special round for those who shoot light weight revolvers that cannot support +P rounds. 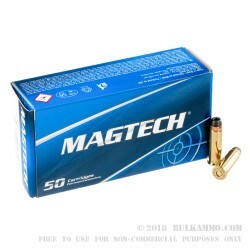 This is a great load by the MagTech brand that offers a heavy weight projectile with a Semi-Jacketed Soft point design that delivers 158 grains of lead on target. 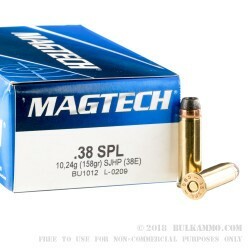 MagTech is a formidable competitor on the open ammunition market with a long legacy of in-house supply for components and a good reputation for providing high quality ammunition to shooters of all types including law enforcement. The above average performance of this round makes it a potent threat stopper for the ultra-light .38 Special crowd. 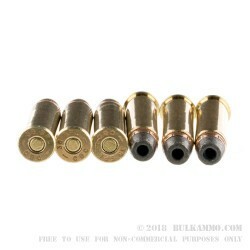 It can also be an effective training round for those who are using a .357 for personal or home protection duty, but do not want the punishing training experience of the Magnum cartridge when they can save some money and discomfort by working with this comparatively milder load. MagTech offers high quality ammunition across the board and it’s self defense offerings are perennially very well received by the shooting community. It’s a bit dirtier ammunition to shoot than some competitors but offers a strong performance for shooters who need this particular load to satisfy their requirements. 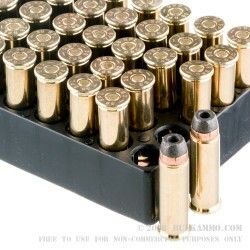 Suitable for use in any .38 Special firearm. Not fancy but does the same job the high dollar stuff. I put an order in on a Monday morning and received my ammunition Tuesday morning. A++ Fantastic customer satisfaction!